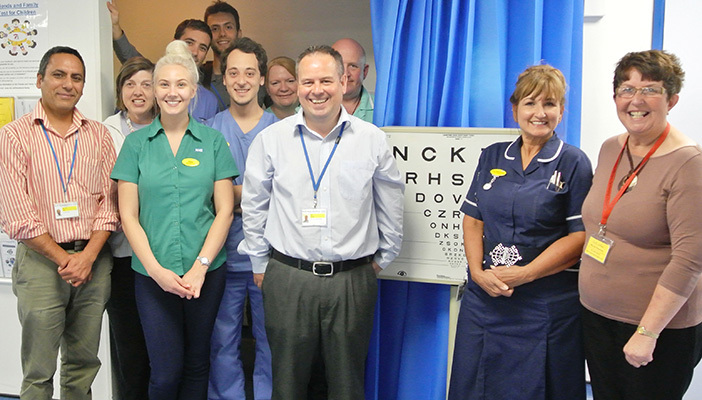 It was an eight-year battle to secure Phil Smith as an Eye Clinic Liaison Officer (ECLO) at Torbay Hospital, as Stephen Weymouth, Business Development Manager at Action for Blind People, explains. 1. When and why was a decision made to appoint an ECLO? Torbay has been trying to get an ECLO within the eye unit for about eight years, but unfortunately funding has always been an issue. Through the RNIB group “Being There” project, Torbay was highlighted as a priority hospital for ECLO support. As a result, we were able to secure “pump priming” from the project to place an ECLO in post. 2. How long did the process take to appoint an ECLO? My first meeting with Torbay was in February of this year and an ECLO was appointed in mid-July. 3. How was the hospital persuaded to appoint an ECLO? For example, was a business plan drawn up showing the merits of appointing one? The hospital already knew of the benefits of an ECLO in terms of patient care, but didn’t fully see the potential cost savings that can also occur. At my first meeting with them, we discussed how cost savings are clearly evident with an ECLO. After that, the fact that we were able to provide pump priming in the first year secured the opportunity. 4. Who is funding this post and for how long? Action for Blind People are funding the post fully in year one; year two is 50 per cent funded between Action and the Trust; year three is 25 per cent Action and 75 per cent Trust; and year four will be 100 per cent Trust funded. 5. Is it full time or part time? 6. How has the decision been met by hospital colleagues? They are overjoyed with the appointment, as they have wanted an ECLO for nearly eight years. 7. What do you hope the benefits will be of having an ECLO at the hospital? It will ensure that patients get access to information and emotional support at that critical point when a diagnosis has been given.